The Okanagan area of southern British Columbia is situated on the Sonoran Desert, a wide stretch of land that runs the length of North America from Mexico to British Columbia. Nestled among fruit orchards and vineyards on the western shore of Okanagan Lake, this city of 12,000 residents is perfectly positioned to take advantage of the arid Mediterranean-like weather of the Okanagan Valley. Enjoy a round of golf or a wine tasting tour and leisurely lunch at one of the many local wineries and then head back to your vacation home to enjoy Lake Okanagan up close and personal. The largest of a chain of five lakes in the Thompson-Okanagan region, Lake Okanagan supports a variety of activities from house-boating to waterskiing. Houseboats can be rented for extended touring around the lake, and fishing is a popular pastime with the water full of rainbow trout, carp and ling cod. Be careful of Ogopogo - the Loch Ness monster of Lake Okanagan. With a water temperature that reaches 75 degrees in the summer, and 320 km (100 miles) of shoreline, visitors should not forget their swimming suits. The Okanagan Valley, stretching from Osoyoos at the US border north to Vernon, is laden with orchards, making it especially appealing in spring when the fruit trees are in full bloom. The best time to pick up some of the valley's bounty is mid-August through early September. However, as early as the end of June, the fruit starts ripening: cherries (late June through mid-July), peaches (mid-July through September), pears (August through September), apricots (mid-July through mid-August), plums (September), apples (August through October), and grapes (September through mid-October). Fruit aside, winemaking is the hot ticket in the Okanagan, and British Columbians have long taken pride in their wines. Nearly three dozen quaint wineries set in lush vineyards operate in the Okanagan Valley, welcoming visitors to sample world class wines while enjoying the scenery of nearby lakes and mountains. Take a self-guided wine tour, and experience the magic first hand. Sonaran Estate Winery is located near the Northern boundary of Summerland, on the lakefront with a panoramic view across beautiful Lake Okanagan, toward the vineyards and orchards of Naramata and the wilderness area of Okanagan Mountain Park. A visit to Sonoran Estate is a treat for all your senses. Let your gaze wander across the hazy mountain ranges that seem to go on forever until they reach the blue summer sky. It's a little piece of paradise, with heavenly wines to match. A small and intimate winery, visitors are welcome at Thornhaven for complimentary wine tastings. Enjoy the view of the surrounding vineyard with a glass of wine along with an assortment of cheese, deli meats and baguettes available for purchase. Or pack a picnic and enjoy the Santa Fe style courtyard in the Okanagan summer sun. Wines made at Thornhaven include Pinot Noir, Chardonnay, Pinot Meunier, Sauvignon Blanc and Gewurztraminer. Open daily from May 1 to mid October. This 155-acre winery has free half-hour tours of the vineyard, followed by a tasting of featured wines. Souvenirs, wine glasses, books and spirits available at the wine shop. Dirty Laundry Vineyard is located in Summerland, overlooking other vineyards and orchards, Trout Creek Canyon and the Kettle Valley Railway Trestle. Wines produced at the vineyard are made 100% from grapes grown on the premises. Three styles of Gewurztraminer, Pinot Gris, Riesling and late harvest Chardonnay are produced as well as a Rose. Tours are available. While a small winery, Adora is gaining large acclaim for their bold and robust wines. 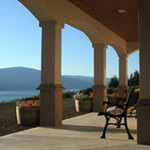 Their wines are available across Canada, and they can be visited at their vineyard in Summerland. Their signature wines Decorus and Maximus bear Latin names but the vintage is written in Roman Numerals. Winemaking philosophy: make intense wines, blended to put the spice points in and mature slowly. A favorite destination for snorkeling fans and sunbathers. The park has three beaches bordering Okanagan Lake. During the winter, skiers and snowboarders frequent Apex Mountain Resort, located southwest of Penticton - an easy commute from Summerland. Unique in the Okanagan Valley– a place where you can step back in time and experience rail travel as it was almost one hundred years ago. Beautiful vistas unfold as you wind your way through Prairie Valley – a quilted patchwork of lush orchards, vineyards and fields of green. Rock cuts and natural landscapes provide another kind of beauty as the train takes you onto the Trout Creek Trestle Bridge 238 ft (73 metres) above the canyon floor. Powered by a restored 1912 locomotive called the 3716 or a 1924 Shay you can see all from two 1950's passenger coaches (Canyon View & Faulder) and three open air cars. (Kettle, McCulloch and Winslow ) Friendly, informative guides bring the history of the railway alive. First Nations legend has it that the large lake creature was originally a demon possessed man who had murdered a well known and respected local man named "Old Kan-He-Kan." In memory of this man, his people named the beautiful lake "Okanagan." To pay for his sins, the gods changed the murderer into a lake serpent so he would forever be at the scene of his crime and suffer eternal remorse. Over the generations, the legend gained credibility through retelling and hundreds of reported sightings. It wasn't until 1872 that the lake creature was actually spotted by a settler. Mrs. John Allison, a resident of Westbank at the time, was frantically watching the lake during a storm looking for her husband. What she saw instead was a large object, same distance out, swimming rapidly against the storm. She reported what she saw and this became the first official sighting of the soon to be famous Ogopogo. Aeration - Letting a wine "breathe" before drinking it in order to soften the tannins, smooth out the wine, and allow the bouquet and flavors to open up. Young red wines benefit most from aeration, which is accomplished by decanting the bottle into another container; or else, by swirling the wine in a glass. Aftertaste - The "shadow taste" remaining in your mouth just after swallowing a sip of wine. Important in wine tasting because it can reveal an extra attribute or fault which might not otherwise be obvious. Balance - A subjective term used in wine evaluation. A wine in which the tastes of acid, sugar, tannin, alcohol and flavor are in harmony is said to be "in balance." Body - The feeling of a wine's weight in the mouth, such as full-bodied, medium-bodied or light-bodied. Bouquet - As a wine's aroma becomes more developed from bottle aging, the aroma is transformed into a bouquet, which is hopefully more than just the smell of the grape. Complexity - When a wine is at once rich and deep, yet balanced and showing finesse. No greater compliment can be paid a wine. A mature Chateau Latour, d'Yquem or La Tache Burgundy are prime examples of complex wines. Charming - Usually implies lightness and is patronizing when describing wine that should have more impressive qualities. Clarify Refers to the wine-making operation which removes lees - dead yeast cells and fragments of grape skins, stems, seeds and pulp - from grape juice or new wine. Crisp - Tasting term to describe good acidity and pleasant taste without excessive sweetness. The Summerland Resort is located on Lake Okanagan in the heart of Okanagan Valley in Southwestern British Columbia. Situated 519 km (322 miles) northeast of Seattle, and just 420 km (261 miles) northeast of Vancouver, Summerland is a 4 hour drive from Vancouver either via Highway 3 through Manning Park and north on Highway 97 or via the Coquihalla Highway 5 and the Coquihalla Connector Highway 97C to Highway 97 south, either route a spectacular drive. The Summerland Waterfront Resort can also be accessed by air through either Penticton or Kelowna. Penticton Regional Airport has service from Calgary or Vancouver while Kelowna International Airport not only services Vancouver and Calgary but also has direct flights from Edmonton and Toronto as well as Seattle.